if I were to pick one of my own dishes. Of all the Foodies on the worldwide web, I think I'm the one who loves Duck Meat the most. 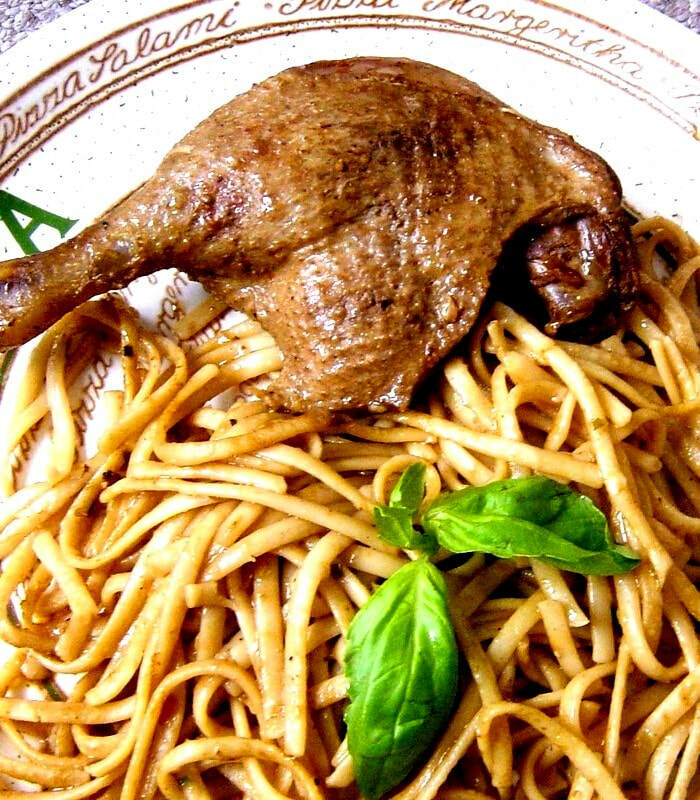 "Duck and Linguine"are a marriage made in heaven. 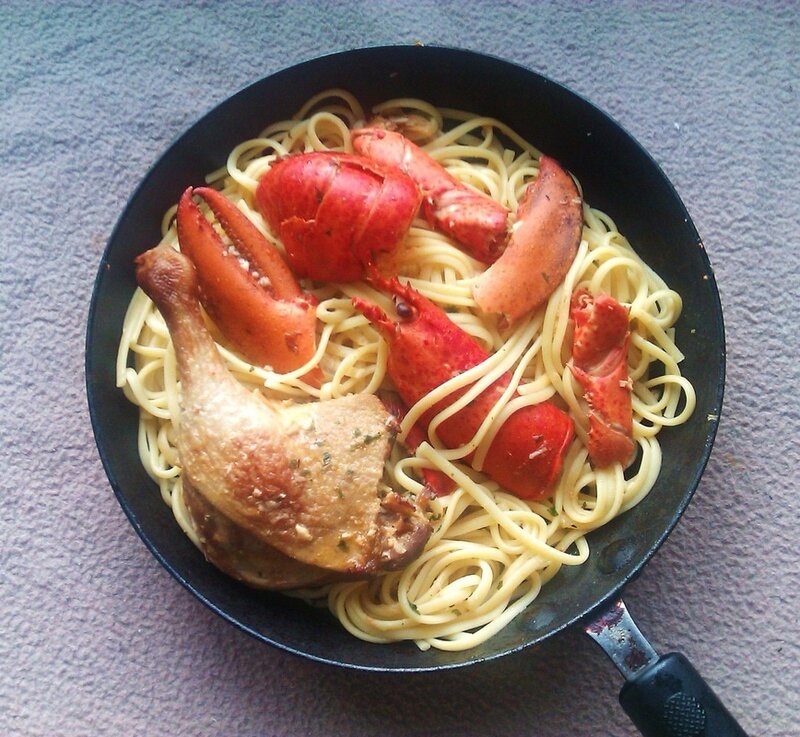 I only like to eat Linguine and other long Pastas with Duck or Shellfish such as Lobster, Clams, or Mussels.This is a simple and easy dish that I savour every time I make it.This is by no means a fixed or traditional recipe. Although recipes for this dish vary. 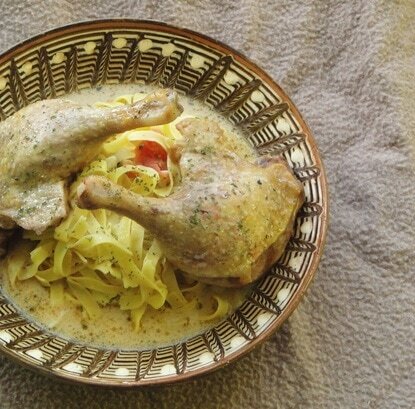 A form of Duck Ragu does exist in the Northeastern part of Italy, and is very popular among some celebrity foodies. others use whole ducks, I like to use duck legs. The key to the success of this dish is making a great base, to flavor the pasta. To do this, we have to make the duck succulent and juicy; that has a lot to do with making a good base for the sauce, which the duck is cooked in. 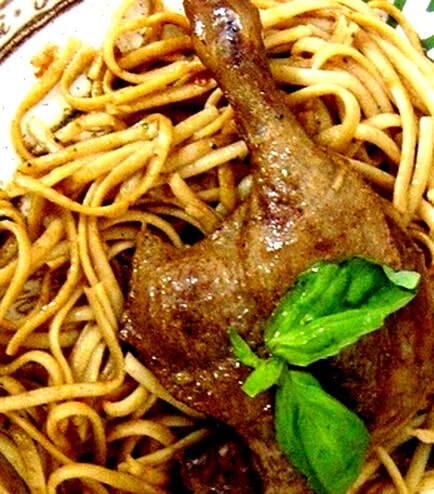 The duck is steamed and cooked with ingredients such as Soy Sauce, Onion, Garlic, Tomatoes and a little Italian Red Wine. Basil is my herb of choice, for me Basil is simply the best herb in the world. 1 garlic bulb peeled and diced, Tomatoes of any kind 3 large ones or 9 small ones diced, 2 tbs of a Sweet Red Italian Red Wine of your choice. Or Portuguese Port which works well in this dish. 7 tbs soy sauce,1 or 2 tbs of dried Basil or a bunch of fresh chopped Basil, Salt to Taste. 4 tbs of light soy sauce and 1 teaspoon of salt and stir. Then add tomatoes seeds and all, in their juice. Then ADD duck legs (skin side up) and sprinkle 3 tbs worth of soy sauce over the top and surface of the ducks. This adds color and packs flavor. Then sprinkle half a teaspoon worth of salt on top of ducks, distributing as evenly as possible on each duck leg. Cover and turn heat to low, and let them simmer for 15 minutes. 2. During that time. Bring a pot of water to a boil. Sprinkle a generous amount of Salt into the water and ADD a pack of Linguine or Spaghetti. Boil to your preference, but leave 2 minutes of extra cooking time, as the pasta will finish cooking in the sauce. It's okay to leave a couple tablespoons of water behind, to prevent the pasta from drying out. Set Pasta Aside for later use. 3. After 15-20 minutes turn ducks skin side down, and sprinkle another half a teaspoon worth of salt on ducks-again trying to distribute the salt as evenly as possible among the duck legs. Add wine. Then cover and let simmer for 15-20 minutes. Use discretion and ADD more water if Sauce evaporates. Afterwards turn duck legs skin side down for the last time for 10 minutes. If the ducks look pale or uncooked then let them simmer for longer this way, until they have a nice brown tone. This could take up to 15 minutes of extra time or more. 5. Cook duck legs skin side up for the remaining time-basically until they finish cooking. 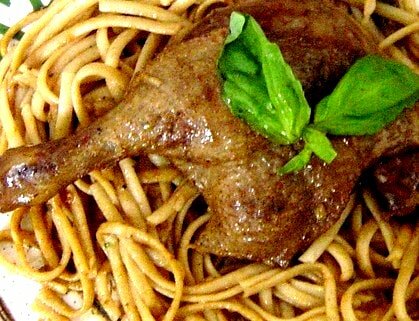 During the final minutes, finish cooking pasta in the pan with duck legs and ADD chopped Basil, or dried Basil. 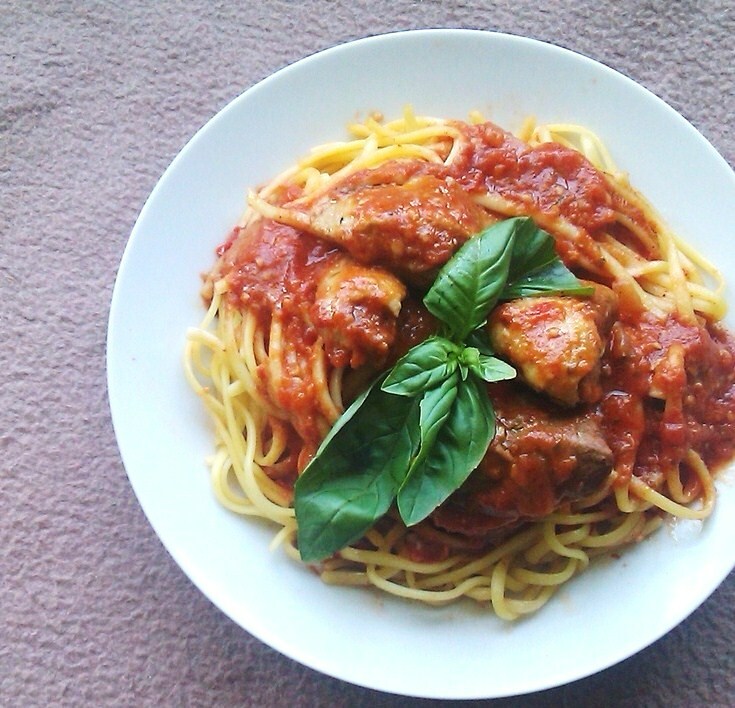 Stir the Pasta and sauce together. Check for salt, and add more if you feel the need. I recommend leaving the pasta to sit for ten minutes before serving.